Fresh produce in New Orleans usually arrives from places like California or Florida. One company wants to change that. Vertifarms began providing aeroponic farms for New Orleans food businesses in 2011, when company co-founders Doug Jacobs and Kevin Morgan-Rothschild began partnering with Florida-based FutureGrowing to bring aeroponic tower systems to restaurants, markets, grocery stores, and non-profit organizations that want to grow their own local crops. Aeroponics is the process of growing plants in an air or mist environment without the use of soil or an aggregate medium. Aeroponic growing systems, which leverage carbon dioxide from the air, nutrient infused water in the form of mist delivered to plant roots, and a light source either artificial (fluorescent, LED, etc.) or from the sun to enable plant growth can be located indoors inside of a building, underground, and stacked on top of one another. After experimenting with several aeroponic techniques, Morgan-Rothschild says they “fell in love” with the Tower Garden. Each unit has a two-and-a-half foot base with a twenty-gallon reservoir for water and nutrients, as well as a small pump. The tower stands six feet, nine inches tall, and the sides are studded with slots where seedlings are inserted. A pump delivers the water-nutrient combination through a hose to the top of the tower, and then it descends as a fine mist, bathing the plants’ roots. No growing medium is required. Since water recirculates, the system requires very little to grow a variety of plants, from leafy greens and herbs to cucumbers and melons. Morgan-Rothschild noted that the towers are also portable; during a recent tropical storm, one customer’s crops survived when they were quickly moved inside. Each individual tower system costs $500 – $600. The company provides not only the equipment, but also assistance in helping clients customize their crops to meet their specific needs. Morgan-Rothschild, COO of Vertifarms, oversees each growing system from installation to management. Jacobs and Morgan-Rothschild’s idea for an urban agriculture company originated during an entrepreneurship class at Tulane University and grew as they shared their idea with other entrepreneurs and business leaders in New Orleans. In 2011, the two presented their business plan during the New Day Social Venture Challenge at Tulane and won a $10,000 grant. They also shared their plan at the PitchNOLA social innovation competition that year, where their company was voted “Audience Favorite.” They continued to market and grow their business through an invitation to participate in the annual Idea Village Entrepreneur Challenge, a business development program in New Orleans. Jacobs notes that much of the company’s marketing has consisted of networking within business incubators and entrepreneurship ventures. Currently Vertifarms has five projects in the city of New Orleans. Their systems provide fresh produce to be sold in stores and restaurants and also provide educational opportunities for non-profit organizations. The company’s newest project is in Haiti, where an aeroponic farm has been established at a school in Port-au-Prince. 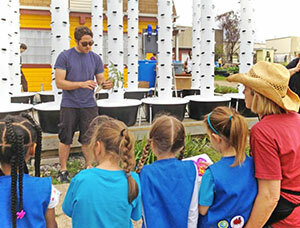 Future plans include starting an urban farm in New Orleans. According to Jacobs, they have not yet secured the land or the capital for that project. “It’s a challenge, trying to buy land for a farm in the urban core of the city,” he says. Compact aeroponic growing is a practical and sustainable solution for growing fresh, nutritional food in places with a scarcity of water and clean soil, according to Jacobs.